The USDA has updated the food pyramid diagram and the food groups are no longer stacked making it appear one food group is more important than the other. The pyramid groups are now next to each other, side by side. To achieve and maintain a healthy you, you need to maintain a well balanced diet by including the nutritional foods from all groups. Look closely at the current food pyramid for the recommended daily allowances. Couple these recommendations with good fitness and you are on your way to a healthy lifestyle. The below food pyramid picture is NOT the current recommendations. The pyramid recommendations were updated in 2005. The USDA updated the guidelines and the pyramid to advocate a healthy lifestyle and balanced diet with a concentration on fresh fruits and vegetables, whole grain, grilled lean meats, nuts, dried beans and lowfat or non-fat diary products. 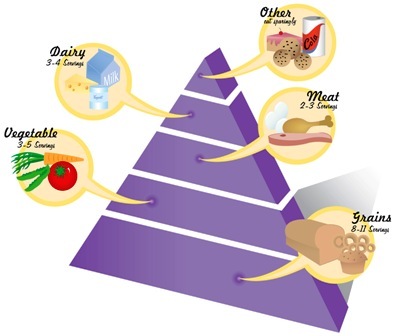 The USDA Food Pyramid was revised in 2005 and is scheduled to be revised in 2010. Along with the pyramid review, take the time to review USDA Guidelines USDA Guidelines for the current recommended dietary guidelines for Americans.